FOR IMMEDIATE RELEASE Calabasas, CA: The Cannabidiol or CBD market has seen a striking increase in growth as consumers and health practitioners begin to realize the benefits of CBD. Since hemp-based CBD has no psychoactive properties, it is legal in all 50 states. A growing number of people around the world are experiencing the practical health benefits of CBD, from cancer patients finding relief from the side effect of chemotherapy to the more than 200 million people in the US suffering from sleep, anxiety or chronic pain issues. The CBD market is growing at such a rapid pace, that The Brightfield Group projects the market size to reach $22 billion by 2022. “The growth in the industry has created a flow of CBD entrepreneurs entering the business, but few understand the dynamics, use and dosing requirements” says Rick Diamond, CEO of the CBD Training Academy. The Academy is leading the charge to ensure that industry professionals are trained and knowledgeable to consult with clients. The CBD Training Academy will be presenting a live training event for people in the business and those wishing to enter the industry of CBD consulting or sales. 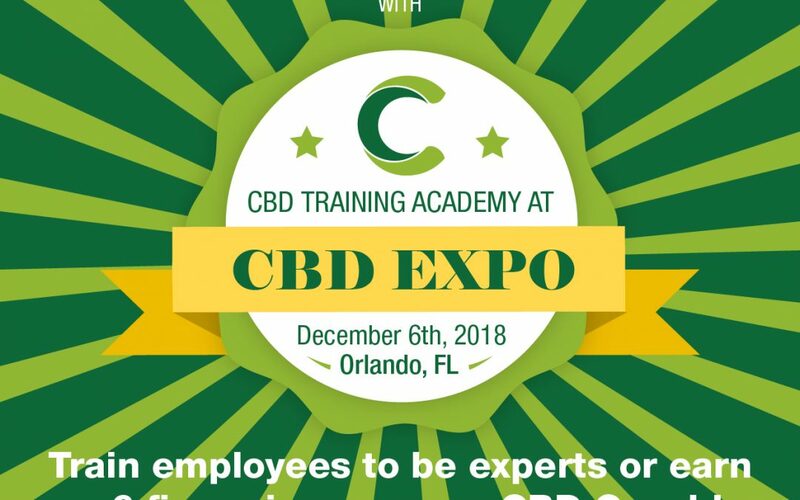 The event will be held at the CBD Expo in Orlando, Florida on December 6th, 2018. The event will feature a “Hands-On” session where attendees will learn how to make CBD products as well as information about CBD’s history, methods of use, dosing as well as how to choose quality CBD products. More information can be found at The CBD Training Academy website at CBDTrainingAcademy.com or visit them at the CBD Expo in Orlando at booth #102, December 7th & 8th, 2018 at the Orlando Hilton. The courses are also available online for those that cannot make it to the event. On-demand training is accessible on any device and participants can move through the curriculum at their own pace. A certification is available to those that complete the course. For more information about this topic, or to schedule an interview, please call Emily Andros at 832-732-5063 or email [email protected].